Nutrient rich cream with anti-ageing baobab oil, Davidson plum, edelweiss alpine extract and Organic Green Tea Extract which are high in anti-oxidants and vitamins to fight free radical damage, tighten tone and regenerate cells and promote elasticity and hydration, increase blood flow to deliver vital nutrients to cells. Hyaluronic Acid to hold moisture for youthful, vibrant, plumper skin. Undaria Pinnatifida extract (Seaweed), Abyssinian oil and cardiospermum for anti-aging, and reduces wrinkle depth & age spots. Black Current seed oil high in Vitamin E healing, Vitamin A reverses damage and rejuvenates collagen, B5 encourages growth of new epithelial cells. 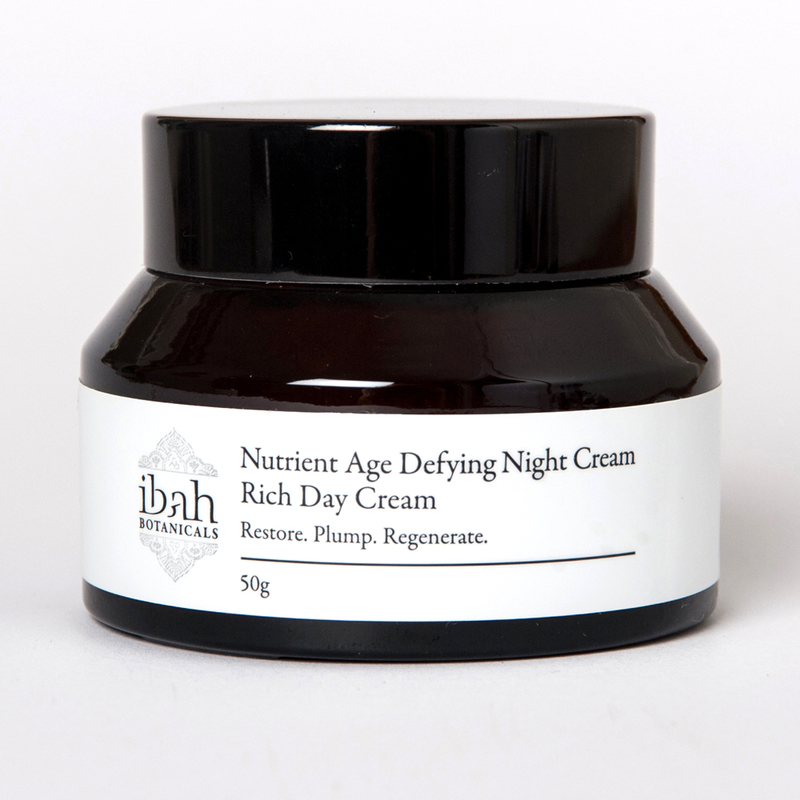 An excellent cream to soothe, regulate, balance sensitive skin and nourish devitalised skin. Directions: Apply at night or day to cleansed face and neck. *Aloe Vera Leaf Juice, *Camelia Oil, *Coconut Oil, Glyceryl Stearate Citrate, *Glycerine, *Jojoba Australian Oil, Cetearyl Alcohol, *Shea Butter, Hyaluronic Acid, *Octyldodecanol / Black Currant Seed Oil / Sunflower Seed Oil Unsaponi􀀨ables / Cardiospermum Halicacabum Flower/Leaf/Vine Extract / Tocopherol / Sunflower Seed Oil / Rosemary Leaf Extract, *Green Tea Extract, Glyceryl Caprylate / Glyceryl Undecylenate, Stearic Acid, *Cocoa Butter, Abyssinica Seed Oil, Baobab Oil, Davidson Plum, Acacia Senegal Gum / Xanthan Gum, *Undaria Pinnatifida Extract (Fucoidan), Vitamin B5, p-Anisic Acid, Vitamin A, Citric Acid, Iris Florentina Extract, Edelweiss Alpin Extract, Sandalwood Essential Oil, Petitgrain Essential Oil, Vitamin E – Natural. *Denotes Certified Organic.